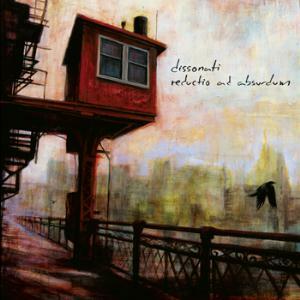 Dissonati are a trio based in the Pacific Northwest region of the US. In the spring of 2006 drummer John Reagan (formerly of late Seventies outfit Harlequin Mass) formed a band called Elsewhen with Portland-based multi-instrumentalist John Hagelbarger; later that same year the duo teamed up with Ron Rutherford, another talented multi-instrumentalist (who is also the main composer of the music featured on this album). A couple of years later bassist Bill Bainbridge joined the band, which in early 2010 changed its name to Dissonati. The band have recently enlisted the services of bassist Ryan Hankins to replace Bainbridge in their live performances. In spite of their undeniable chops and extensive experience, Dissonati do not claim to be the best thing since sliced bread, but rather a group of people who share a common love of writing and performing music in the progressive rock vein. Although the band members grew up with the historic bands of the “golden age” of prog, Reductio Ad Absurdum successfully avoids overt derivativeness, and manages to sound fresh and original almost against the odds – something that often eludes younger, more ambitious acts. In fact, the many prog fans who constantly feel the urge to label anything they can lay their hands on will find themselves baffled by this album, which combines the experimental bent of RIO/Avant prog with a somewhat skewed, but very present sense of accessibility. With the exception of the two longer (though not exactly “epic-length”) tracks that bookend the album, the bulk of Reductio Ad Absurdum consists of songs between 4 and 7 minutes with a recognizable verse-chorus-verse structure, though spiced with subtly idiosyncratic details that give their music a definitely unconventional twist. For one thing, quite unusually for a band whose members have reached their full maturity, Dissonati incorporate influences that go beyond the usual Seventies icons. Indeed, nods to Porcupine Tree and Steven Wilson – those standard-bearers of modern prog – can be detected in some of the more atmospheric passages of the album. However, if I had to compare Dissonati to one or more non-Seventies acts, I would mention Discipline and The Rebel Wheel, two North American bands that share the Pacific Northwest trio’s obvious love of Van Der Graaf Generator, but have also manage to establish their own individual sound. Interestingly, it is John Hagelbarger who sounds closest to Peter Hammill in the only track where he sings, the quirky “Age of Foeces”; while Ron Rutherford’s voice is more in an understated singer-songwriter, sounding slightly hoarse and occasionally flat – which, even if not beautiful in any canonical sense, fits the music like a glove. Opener “Can You Hear Me?” introduces the listener to Dissonati’s peculiar musical universe with doomy, industrial-sounding electronics and tense synth that blend almost seamlessly with melodic, almost catchy elements, and plenty of those mood and tempo changes that any prog fan would expect from a 10-minute track. Ron Rutherford’s dry but highly effective vocals follow the development of the musical thread, and the haunting keyboard washes and drawn-out guitar discreetly hint at Porcupine Tree, though with a personal touch. In “Middle Man” Rutherford’s deep, powerful bass lines come into their own, supported by John Reagan’s dramatic drumming and Hagelbarger’s eerie, slightly dissonant synth runs, while the chorus injects an element of catchiness that effectively blends mainstream and experimental tendencies. Hagelbarger’s solo spot, the above-mentioned “Age of Foeces”, brings to mind VDGG in the theatrical tone of the vocals, but the band’s strong individual imprint surfaces in the hammering harpsichord, twangy bass and echoing, distorted guitar solo. With its almost infectious chorus and spacey suggestions, “MindWarp” is Rutherford’s own moment as a solo-pilot, as he handles all the instruments besides vocal duties; while “Senescence” and “Driver” juxtapose accessibility and complexity in a fashion reminiscent of Yes at their best – an impression reinforced by Rutherford’s stunningly versatile bass work offset by Reagan’s effortless drumming, often veering into jazz-rock territory. However, the album’s highlight comes right at the end, with “The Sleeper”, Dissonati’s own version of “A Plague of Lighthouse Keepers” – similar in structure to the legendary VDGG epic, but more cohesive and (most importantly) purified of any filler. In the 13-minute track, a haunting, almost cinematic instrumental section – sparse and darkly ominous at first, then culminating in dramatic guitar/keyboards interplay propelled by thunderous drums – is bookended by half-spoken vocals and subdued instrumental accompaniment. With top-notch musicianship and solid compositional skills – an element that has become increasingly scarce on today’s oversaturated progressive rock scene – as well as a very sensible running time of about 50 minutes, Reductio Ad Absurdum manages to be original without trying too hard to reinvent the wheel (which is a common problem with younger bands). Eclectic without being rambling or overambitious, the album is an outstanding example of true “crossover” prog –successfully striking that elusive balance between the past and the present – and a genuinely enjoyable listen, with enough quirkiness to please those that do not like their music to take itself too seriously. The striking cover artwork, a painting (titled “Bridgehouse”) by Portland artist Brin Levinson, rounds out this unassuming but highly satisfying package. First, a big thank you for the very positive review. Plus a few comments: That Porcupine Tree influence may be a matter of having listened to some of the same people that Steven Wilson did – such as Pink Floyd. Also, Ron and I both went through big New Wave phases in the early Eighties. Some of our more contemporary textures may have come from that, as well as some of our ideas about song structure, and our liking for non-standard harmonic progressions. And as for an RIO/avant influence, Expose’s Jeff Melton heard that, too – but it’s not all that apparent to me, even though I listen to and enjoy quite a bit of that music, . John R. and I started working together in May 2006, and Ron joined that September. Bill joined some time in 2009 or 2010, left in early 2012, and was replaced by Ryan in mid-2012. Hello John, thanks for your comment! I pieced together the chronology from your FB page and a couple of other sources, so I am not surprised it is scrambled.. The good thing about blogs is that they can be edited immediately, without having to rely on outside help. Anyway, I’m glad you liked my review, and hope to see you again soon. I bought the Harlequin Mass album when we were updating information on the symph bands at P.A. I found out about Elsewhen during the same research period. Good to see these guys still at it. A very good and useful review Rafaella! Thank you for attempting to include some information about the group’s winding path up to this point. Gentlemen, now and for the record, I joined the group on 08/16/2009, and left it on 05/05/2012. The group accepted my recommended name change to Dissonati sometime shortly after I joined, as my rehearsal recordings reflect this (by the time of my first successful recording of 09/13/2009). Thank you for the kind words, Bill! I always try to include some history in my reviews, especially when the band or artist is not too well-known. In the case of Dissonati, it was not easy to unearth the information, but I hope that the end result was not too bad after all :P.
I was fortunate to have received a copy of Dissonati’s “Reductio Ad Absurdum” from John Hagelbarger at NEARfest and it has received many spins on my end – really, really enjoy it! Thanks for reviewing another lesser-known but thoroughly deserving group of top-shelf musicians!